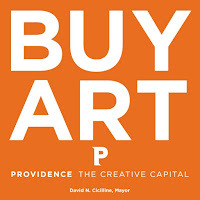 Since December 2008 Mayor David N. Cicilline and the City of Providence Department of Art, Culture + Tourism have partnered with Providence arts venues and individual artists on a marketing and advocacy BUY ART campaign. Whether you buy art for $5, 50 or 5,000, a ticket to a performance, a museum membership or a studio class, participating venues are pleased to offer each art buyer a limited edition "I BUY ART" pins. The 2009 pins with five original designs featuring the artwork of Providence artists are now available at venues throughout the city. COLLECT — INVEST — GIVE — EXPERIENCE ...the Providence Arts Scene. BUY ART Providence window is styled by Lisa Newman Paratore, owner of HOMESTYLE, and Karen Beebe, owner Queen of Hearts (and designer of the dress displayed). Items on display are from an assortment of our artsy downtown merchants. The painting is by Angel Quinonez and is one of the five artworks selected for this year's I BUY ART advocacy buttons. The felt and feathered necklace worn by the mannequin is from Queen of Hearts and made by artist Nori Swennes especially for this Providence Art Window! To find out more about BUY ART Providence, please go to buyartprovidence.org. As a sculptor, I am greatly influenced by flora and fauna observed in the surrounding environment. I abstract and enlarge small parts of nature to create personal interpretations of forms. 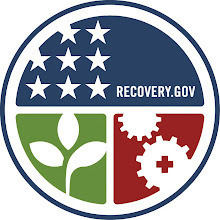 This organic iconography suggests themes of germination, growth, cyclic changes, and regeneration, all of which relate to human and animal life, our basic life needs and urges. The viewer will also have an altered sense of his own size, as I play with scale in my work. The fact that one expects these forms to be tiny is important as they become unexpectedly more powerful when enlarged to a gigantic scale. By enlarging the size of the forms, I wish to make the viewer aware of his / her size in relation to one’s environment and also to add an element of surprise or humor. The sculptures are often composed of groups of units. The piece then loses it’s sense of being an object and becomes an environment. 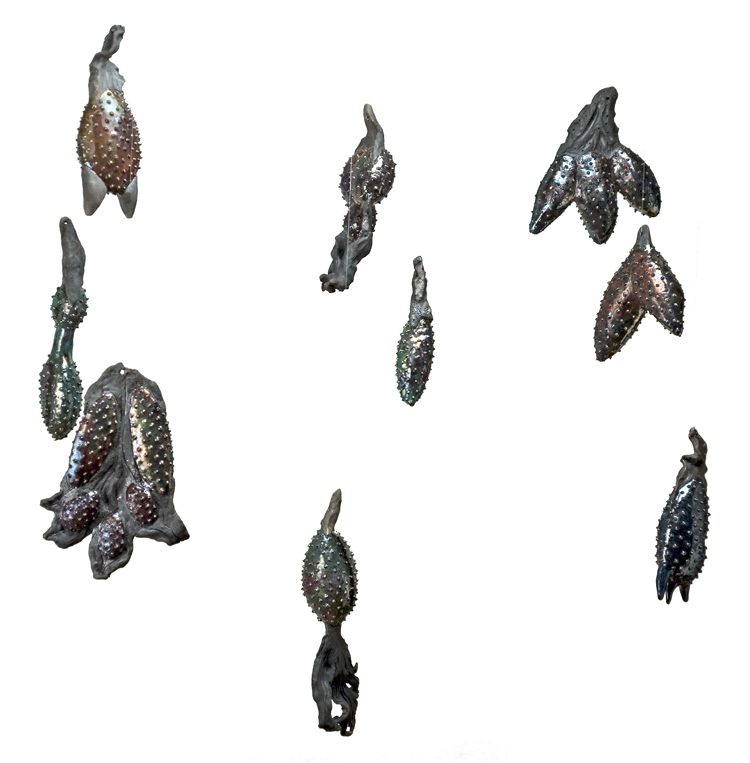 One of my hopes as an artist is that after seeing my sculpture, people’s perception of the complexity and detail of form and texture in small parts of nature will be enhanced. If I am able to augment or alter one viewer’s sensation and appreciation of the natural environment, I feel that I have achieved success in my work. Anne Alexander is a sculptor who lives in Southern Maine. She exhibits her work frequently in both in gallery and site sculpture shows throughout the United States. She carves wood and stone and models clay as sculptural mediums. Ms. Alexander has received two Pollack Krasner Foundation Grants and year long Fulbright Scholar grant to The Dominican Republic. This past year, while on sabbatical from her teaching position at Waynflete School in Portland, Maine, she was attended residencies at The Virginia Center for Creative Arts and The Vermont Studio Center. During this time, she also participated in the International Sculpture Symposium at The Andres Institute in Brookline, NH where her granite sculpture "Touch Me" is permanently installed. To see additional images of her sculpture please go to http://homepage.mac.com/annealexander/ to find her website. Please also fan her facebook page of the same title. This exhibition tells the story of the Paws family, as it was discovered by two sisters and then relayed to their daughter/niece. A well-to-do family that made its wealth in textiles at the turn of the century, the Paws are compelling in their intriguing family history and diverse value systems & aesthetic sensibilities. They are a living and growing, sprawling rabbit clan served by a respectable staff and housed in numerous locations across this country, though they are primarily based in New England. 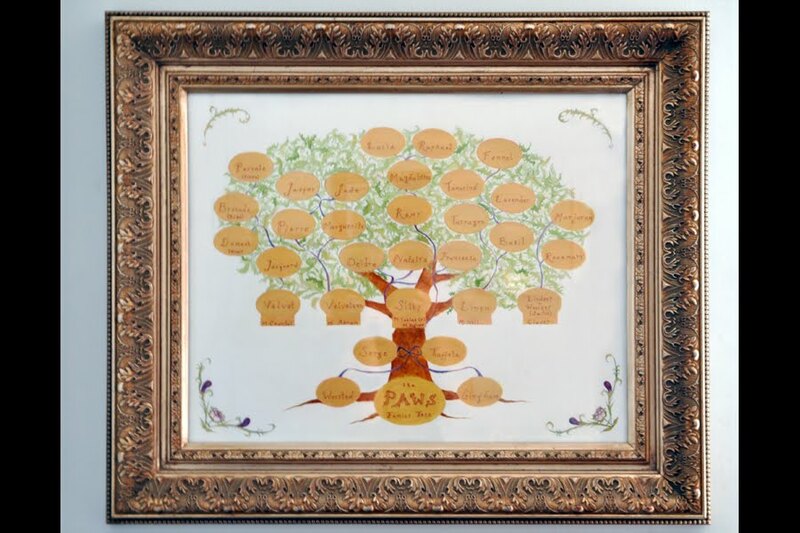 Their story can be a bit unwieldy, full of drama and intrigue; but then, of course, most families' stories are. This exhibition of their living artifacts, historical documents, family pictures, and texts aims to allow viewers to immerse themselves in the Paws and their history. Their private lives, as told through the accompanying private correspondence between two sisters, has been thrown open and laid bare for the viewer. Our hope is that by sharing their reality, the viewer's own reality is enriched. Artist Jillian Piccirilli studied art and anthropology at Cornell University, where she was the recipient of the University's Faculty Medal of Art and Charles Goodwin Sands Memorial Medal of Art. Her work transverses a number of different mediums with a common interest in narrative, history, and expanding one's sense of the real. How little is enough? How much can be taken away before a piece crumbles? My sculptural installations are lean, elegant arrangements of color, light and space; they are presentations of physical facts. I want to isolate and exaggerate particular aspects of the ways we encounter and negotiate our physical world, and bring some awareness and joy to the process. And I feel that the most effective way for me to achieve this is by presenting installations, these restrained arrangements of facts. With restricted use of very particular materials, sheer and lightweight, the installations suggest the presence of light and the absence of weight. Lynne Harlow is a reductive artist based in Providence, RI and New York, NY. 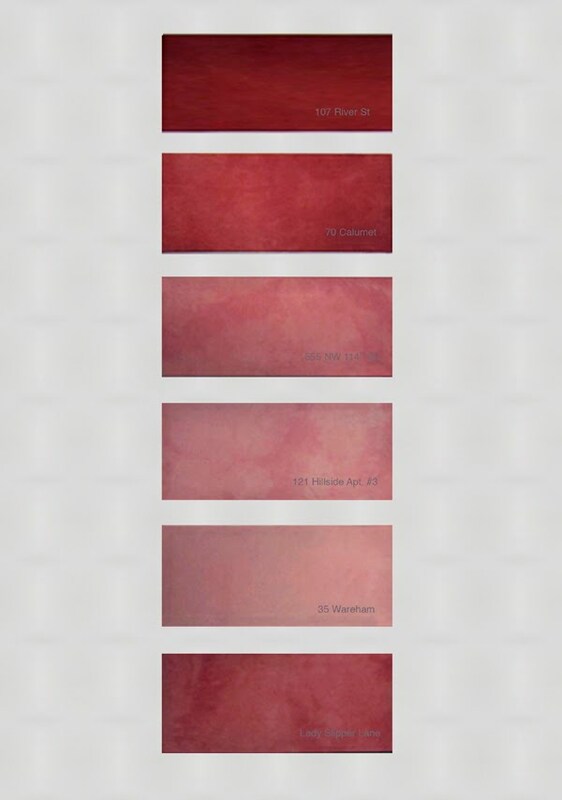 She makes large scale site-specific work and small drawings and prints in a language of sensual minimalism. She holds an M.F.A. from Hunter College in New York. She exhibits her work in the U.S. and internationally, including recent shows at The Skydive in Houston, TX, P.S. 1 in New York and RMIT University in Melbourne, Australia. In 2002 she was a visiting artist at the Chinati Foundation in Marfa, TX. To learn more about the artist, please go to lynneharlow.com. Amy DiPlacido received her BFA at Massachusetts College of Art and Design in 2007, and recently received an MFA in fiber at Cranbrook Academy of Art. She’s a mixed-media installation artist who explores the concepts of color, language, and perception. She has held two solo exhibitions, and has also shown at The Fuller Craft Museum. Recent awards include Student Showcase in Fiber Arts Magazine and Artist in Residence programs at Art Farm Nebraska and Art 342 in Colorado. To read more about the artist, please go to amydiplacido.com. As a child I was always setting up house. Now my art documents and plays with notions about setting up a life. The panels I have made for the RI Housing site place my personal notions about home against some of the more unsettling forces that challenge people’s sense of security out in the world. 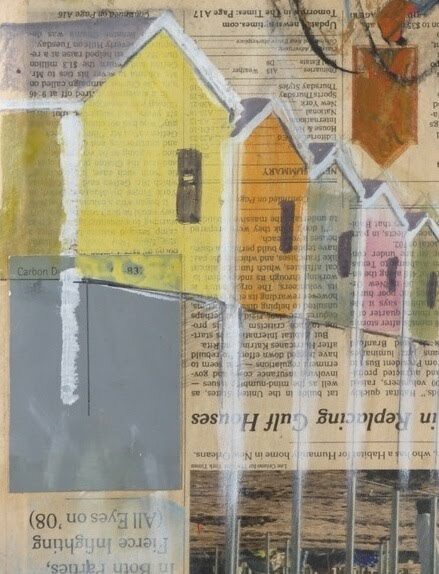 By depicting colorful post-Katrina houses on stilts, collaging in photos of dwellings left in war zones, and using a yellowed city planning map, I can weave my own story into a larger landscape. One panel plays off my ideal of living by the ocean despite the problematic reality that sea level is rising. The other panel contrasts the outline of an empty, open center space and comfortable chair against antiquated wallpaper, urban rooflines and bombed out towers. The pieces deal with the subtle tensions between a desire to be anchored and the keen understanding that nothing is gauranteed. Margie Butler’s art amasses layers of personal narrative to depict a visual vocabulary of female space. Generally working in smaller ephemeral pieces, Margie sought to expand her scale for the chance to participate in Providence Art Windows. Part of her art making is the collection of clippings, objects and stories that then become game pieces and launch pads for the collaged landscapes. The volume of what is accumulated prompts a never-ending process of editing and re-arranging. Each piece presents the chance of finding possibility and pleasure in the chaos. Margie completed her MFA at The Art Institute of Boston in 2006 and has exhibited at The University Gallery/UMass Dartmouth Star Store, Artworks!, 5 Traverse, and Y.E.S. Gallery. In addition to her studio practice, Margie consults for national clients and arts organizations on marketing projects. Locally Margie has worked closely with the City’s Department of Art, Culture + Tourism to launch the art advocacy initiative Buy Art Providence. 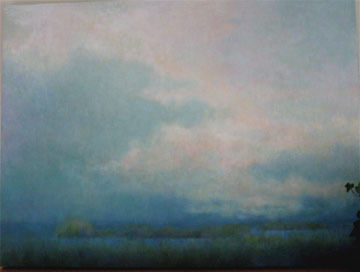 To learn more about the artist, please go to www.margiebutlerart.com. Although my paintings range from very small to very large, this space provides a great opportunity to show some of the large landscapes that have been a recent focus. The pieces chosen for this exhibit are inspired by land and sea, mostly along Rhode Island’s south coast. Although inspired by real places, how I capture an image, how I play with color, how I manipulate the paint is as important as the subject matter. 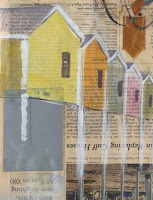 Paula Karen Dewell lives in South County and works in a variety of media, including acrylics and water miscible oils. She is a retired public school art teacher and currently an adjunct faculty member at Rhode Island School of Design, teaching in their summer Pre-College program and Young Artist program. She tutors adults and young adults privately. Paula has recently spent much time on landscapes, but still lifes, flowers, portraits and animals are always appealing subjects to capture as well. She feels that occasionally diverging and experimenting keeps her artwork fresh. Her work can be found at the Charlestown Gallery in Charlestown, Rhode Island, and Sarah Jessica Fine Arts in Provincetown, Massachusetts, as well as in exhibits in other galleries in Rhode Island and Connecticut. Commissions and free lance work available. 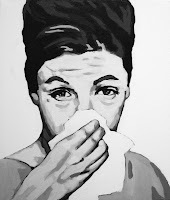 This body of work begins as portraiture and draws influence from retro and vintage black and white film. The series is a collection of black and white acrylic paintings, all on 12"x14" canvases. Every individual character is displaying the general and sometimes over exaggerated emotion of "sadness" , yet each painting represents the emotion in a unique way. The tissue ties each painting together as well as cinematically symbolizes "sadness" . As a whole, one can see the transition and of the many complexities and forms of the emotion. The sight of a mass of crying women does not only invoke the feeling of sadness, but also displays the complexity of the emotion by taking it to an almost comical level. The display of the paintings in a large uniform grid increases the overall impact through visual unity and allows the viewer to move through the work as film. Join the artists at Design Within Reach (210 Westminster Street) on Saturday, December 5th, at Design Within Reach, from 3-5:30 PM. The Providence Preservation Society Holiday Stroll will be happening at the same time, and the reception will wrap up before the 6pm tree lighting at City Hall. Plan to come Downtown and watch the windows transform the week before if you cannot make it to the reception. To take the tour on your own, a downloadable map will be available on the blog on December 2, and printed maps throughout Downtown Providence.